Dr. Lieber was born and raised in the Bronx, N.Y. and received his bachelor of science in biology, with a minor in chemistry, from the State University of New York at Oneonta, where he was on the dean’s list. Dr. Lieber earned his podiatric education at the Pennsylvania College of Podiatric Medicine, now the Temple School of Podiatric Medicine, where he graduated in 1981. Following graduation, Dr. Lieber accepted a residency in Podiatric Surgery at the Broad Street Hospital and Medical Center in Philadelphia. 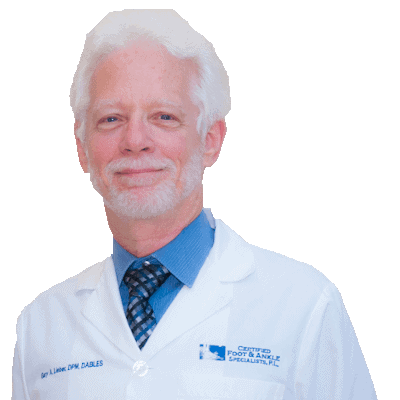 Dr. Lieber has been practicing podiatric medicine and surgery in Delray Beach, Fla. since 1982 and recently merged his practice with Certified Foot and Ankle Specialists. He has been board certified by the American Board of Lower Extremity Surgeons since 1994 and is a Diplomate of the American Board of Lower Extremity Surgery and a Fellow of the American Professional Wound Care Association. Dr. Lieber listens very carefully to the patient’s description of symptoms and uses the appropriate combination of 35 years of experience, medical judgment and technology to arrive at a diagnosis. Dr. Lieber is skilled on numerous procedures, including correction of bunion deformity, straightening of hammertoes, excision of neuroma, among others, and remedies even more medical conditions that include peripheral neuropathy vascular issues such as painful leg cramps, Lymphedema heel pain, neuroma, fungal-infected nails, and more. He also specializes in Minimal Incision Surgery (MIS) of the feet, which is a technique that allows for the correction of painful bunion, hammertoes as well as painful corns and calluses. Dr. Lieber has used a combination of medical, surgical and biomechanical approaches to treat all types of foot pain and other foot problems. During this time, he has been the physician of the last resort for hundreds of patients and has been able to diagnose the problem and bring them relief. Treatment can be as simple as nutritional supplements, prescription medications, different types of dressings, immobilization with soft casts and braces, or surgical correction for painful foot deformities that can and years of chronic pain. When he’s not working hard for his patients’ comfort, you’ll find him coaching the Yeshiva High boys varsity soccer team, spending time with his family and friends at the Boca Raton Synagogue, and continuing his education.